Fully-Loaded Moroccan Tofu Cubes Baked Potatoes — Always Plant-Based. Always Delicious. Hodo. 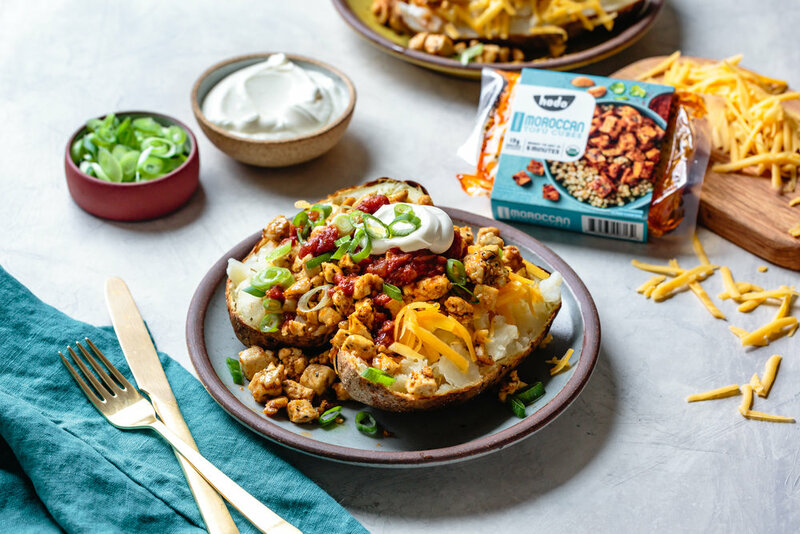 Baked potatoes get a protein-rich twist from savory spiced Moroccan tofu cubes, gooey melted cheese, and a fresh sprinkling of scallions. Position a rack in the center of the oven and preheat to 450ºF. Scrub and rinse the potatoes well, pat them dry, and rub the skin of each with the ghee and a little salt. Pierce the skin of each in three or four places with the tines of a fork. Place the potatoes on a rimmed baking sheet in the oven, and roast for 45-75 minutes, depending on the size of the potatoes, until very soft when pierced with a knife in the center. When the potatoes are finished cooking, warm a skillet over medium heat. Add the tofu cubes and cook, stirring occasionally, until the tofu is heated through and has picked up some color, 5-10 minutes. Remove the potatoes from the oven and slice them open down the middle. Use a fork to fluff up the insides. Place a pat of butter in each potato, sprinkle with cheddar cheese, divide the tofu among them, and finish with your desired toppings.